The 30-year director of golf at Ivanhoe Club won eight of the Illinois PGA’s four major tournaments, including the Illinois PGA Championship three times. He also won nine of the section’s Senior majors, and this month he’ll go after his sixth title in the Illinois PGA Senior Championship. He has played in three national PGA Championships, five Western Opens, three U.S. Senior Opens and two Senior PGA Championships. 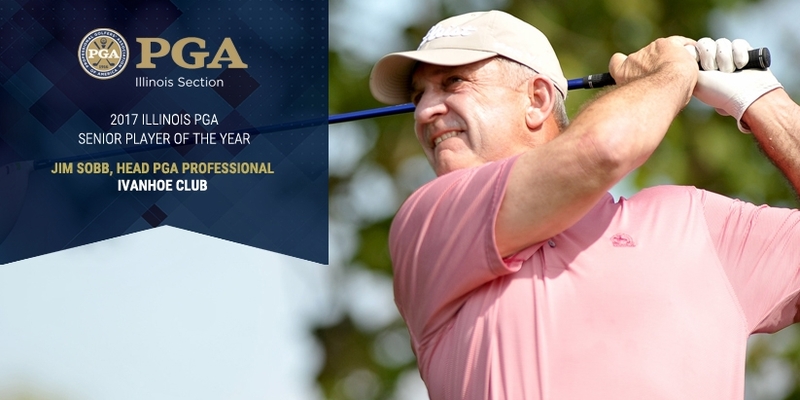 In 2011 Sobb pulled off what may be his most outstanding accomplishment as a player when he swept the IPGA Match Play and IPGA Senior Match Play titles in back-to-back weeks. No other player has done that. What’s more surprising about this Sobb story is the fact that – despite all his playing success within the Illinois section -- he never entertained thoughts of being a touring pro. Clearly there’s more to Jim Sobb than being a tournament golfer. He’s a lifetime Chicago guy with a unique family. His wife Tina has battled Multiple Sclerosis for many years, yet the Sobbs worked to put their two children through college. Son Ryan graduated from Birmingham Southern and daughter Abbey from the University of Mississippi. Even back then Sobb’s focus wasn’t just on golf. He was the quarterback at Palatine High School, where he also played basketball and golf, and entertained football scholarship offers but decided not to take them. So, he headed to Western Illinois for college. Sobb encountered one of the very best college golf coaches when he arrived at Western. Harry Mussatto welcomed him to the team as a walk-on, and Sobb performed well enough as a freshman to earn a scholarship the next year. After his days at Western, Sobb held assistant professional jobs at Hillcrest, in Long Grove, and the now defunct Thorngate, in Deerfield, and landed his first head job at Chapel Hill, in McHenry, in 1983. He also was the head man at Highland Park Country Club before beginning his long run at Ivanhoe. The Ivanhoe job has offered Sobb some other growth opportunities. He created a high school tournament, the Ivanhoe Invitational, and was – for the last three years – the host professional for a Web.com Tour event, the Rust-Oleum Championship. He’s also mentored several former assistants who now hold head professional jobs. Such projects helped earn Sobb the IPGA Professional of the Year honor in 1995 and 2000, the IPGA Private Club Merchandiser of the Year Award in 1997 and the Bill Strausbaugh Award, for service to his fellow pros, in 2012. And in 2015, he was inducted into the Illinois Golf Hall of Fame for his contributions to the game and outstanding playing career. He also spent 10 years on the IPGA board of directors.